Yes, I’m able to work with all types of car insurance companies. Do you come to me? Yes! I am a mobile auto glass installer and I will come to you. Weather: This is a question that you need to ask when getting your windshield installed. Rain: We will need a covered garage that fits the entire car with walking room all the way around it. The dryer the better. Snow & Cold: I recommend that you have the vehicle inside and dry for proper installation. I can come to your house or business if you have a garage or shop with walking room around the entire vehicle. What is the most difficult glass you have installed? Auto glass for Porsches, Audis, Saturns and improperly installed glass from the last installer. I have some rust around my windshield. What can you do about that? Bring the car to a body shop and cut the windshield out there, have them fix the affected area. After the repair is complete we will re-install the windshield. I can scuff the area up with a wire brush, wipe the rust off and then apply a "Sika Primer" that is recommended. My windshield leaks. What can you do about that? If your windshield was recently installed, I can add urethane to it and reseal the windshield or cut out the windshield and repair the problem area then re-install correctly. What kind of urethane do you use? I use "Sika brand products" on all windshields. I have tried other brand urethanes but have found Sika products performance is superior compared to other urethanes. How long have been in the Auto Glass replacement business? I have been installing auto glass since September of 1996 and started my own business in May of 2001. I have worked on cars all of my life. Installing auto glass comes naturally to me. Do you handle rock chip repairs? No. Repairing rock chips entails placing a resin into the chipped area that leaves a noticeable spot in todays tinted windshields. Do you install auto glass that I (the customer) can purchase? Yes, I do but, I do not warranty it. Once you buy the glass there is no warranty from the auto recycler or Ron’s Auto Glass. I will install your glass to the best of my abilities but if it cracks there is NO WARRANTY on it. Just check the glass over for flaws carefully before purchasing it. How far will you travel to fix my auto glass? 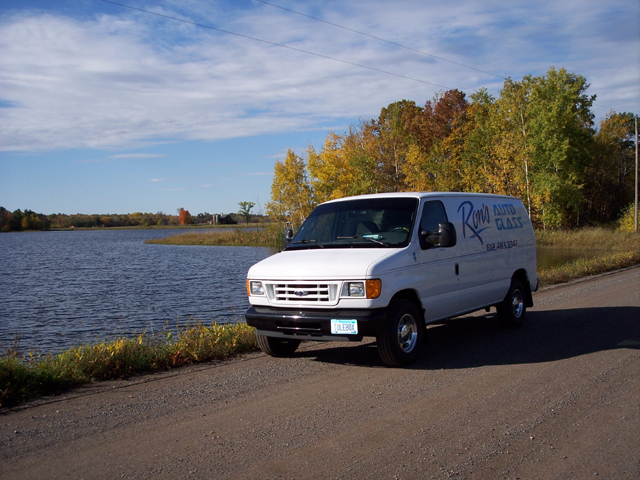 I serve the entire metro area including Minneapolis, St. Paul and the surrounding Northern suburbs. Do you tint car windows? No. However, I will remove after-market window tints. I have been asked about how to remove window tint that has either bubbled or faded over time. Do you ever cut yourself? Yes! Yes I do! Not on purpose but accidents do happen. Have you ever broke or shattered a windshield during installation? Yes, it has happened when installing a used piece of glass. This can easily happen if the glass edges are chipped after it has been cut out of the vehicle. Do you have coupons, discount options or freebies? I do not offer coupons but I do have freebies every once in awhile. For example, at the end of the year I hand out Ron’s Auto Glass calendars to my customers. See our Used Auto Glass page for more information. How Did You Find Ron’s Auto Glass? ©2001-2018 Responsive Website Design by Management Specialties Web Services, LLC.